ALL SEASON ALL WHEEL DRIVE! Sporty Turbo Performance!! CARFAX BUYBACK GUARANTEE!! Navigation and Back-Up Camera!! Lots of Cargo Space!! Power Panoramic Moonroof!! 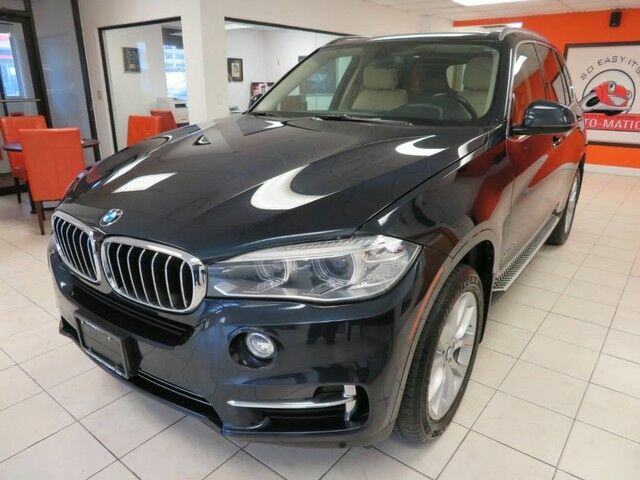 2015 BMW X5 35i 3.0L TwinPower Turbo Sport Utility, Blue with Tan Leather Interior, ft BMW Premium Harman Kardon Sound System with 12-Speakers, AM/FM CD/MP3 with Aux Input and Steering Wheel Audio Controls, DTC/DSC Stability Control, Auto Climate Control, Power Heated Front and Rear Seats, Power Locks, Windows, Mirrors, Fog Lights, Rear Spoiler, Power Tailgate, Keyless Entry, and Alloy Wheels. Just Serviced, Automatic Certified!